Perhaps it is some trick of the light but this brews a shade of ruby I don't see often in tea, like the reddish orange occurring in a fire. While this tea sends waves of citrus rind and cloves across my taste buds, I can not help but admiring its complexity, while nothing coming out in total shock and awe. I'm also thrilled at how it clings to your mouth and its finish is long and soothing. In later infusions it gives up the citrus and replaces it with a butter and cinnamon, still a very nice combo. This was a nice pick up from the Everyday SX, which when sending a sample out to someone else, also noticed a very strong "acidic flavor." Ten Ren Tung Ting Red Box. I recently went on a trip to a local asian market. While there I was not exceptionally thrilled with their tea selection, but I did find two I'd thought I'd give a try. One is this red 300 gram box of Dong Ding or Tung Ting oolong tea. Dong Ding is a mountin in Nantou, Taiwan. 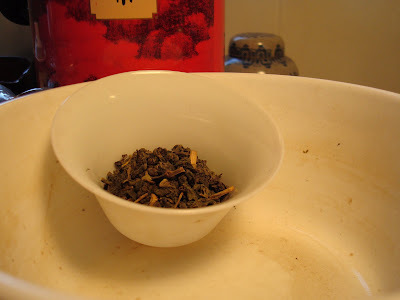 I also picked up 300 gram box of Tie Guan Yin, which I was thrilled to see was heavily roasted. I can not tell you much about either of the teas I picked up but it did look as though most of them were from Ten Ren. Its aroma is actually quite interesting, sorta like a sour cream like aroma with hints of berries and a slightly acidic note. 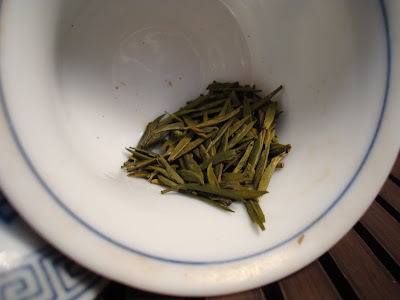 Its palate coats like oil, and the whole tea gives off a rather oily taste. This tea reminds me why I do not drink the green stuff anymore. While it is great in moderation, in repeated brewing it gets quite tiresome, and all starts to taste the same after a while. Yesterday I decided to do a water experiment, as I've heard it repeated many times, and even believed it myself, but I've never put it into a semi rigorous experiment. So here is the experiment, take your brewing vessel, for this smaller is better, as you will end up drinking a lot of tea. Brew the same tea, for two sessions in a row, and for the first session every time you pour the water into the vessel, pour it from as close as possible to the leaves, and pour it straight into the center of the vessel. For the second session every time you add water do it from at least 6 inches above the top of the vessel, and for this higher is better as long as it is comfortable and controllable. You should also pour in a circular motion and if using a gaiwan pour along the sides. I'd recommend using the same vessel both times to try and keep as many parameters the same as possible. Now I'd like to have you try this experiment and please post your results. I will edit this post in a week with my results as I want to try is several different times with different teas. This is a close pour straight into the center of the gaiwan (no leaves in this picture, don't have time for tea right now). This is a high pour, I can get it higher, but its hard to control and take a picture at the same time, though note how the pour is onto the side of the gaiwan and would avoid shocking the leaves with the boiling water. What I can not get in a picture is the circling motion around the edge of the gaiwan you would do when pouring like this. This tea is a yellow tea from Jing Tea Shop, and I should note this is the first white tea I have had. Smells a little like pine resin, crossed with a cake of recent Sheng Puerh. Its appearance is similar to a green tea, but it has a yellow hint to it which sorta reminds me of a stale green tea. A yellow tea is sort of amisterious tea to me its been described as a hybrid of various tea types like its somehow between a green and an oolong. Yet another friend describes it as sorta a cooked green tea. We shall see. For this tea I am treating it similar to a green tea, just enough to cover the bottom of the gaiwan, and leaving a root. I am also going to establish the root with about a 10 minute infusion. with a half full gaiwan. If I had a larger than 100 ml gaiwan I would do a third full, but thermodynamics is tricky and must always be taken into consideration. I should probably explain what Pre-Ming means. Pre-Ming implies that it was harvested before the QingMing Festival. The aroma of this during the steep is quite interesting cooked peas, and perhaps a slight hint of fish oil and smoke. But predominately cooked peas. You know this is definitely a first, this tea tastes like cooked peas. It is like a very strong green tea, but the main flavor is that of cooked peas. In the second infusion it takes on a bit of a minty tone to it, and the finish is slightly bitter like cooked spinach. This is an interesting tea, I just had a successful third infusion and am going for a fourth. But the cooked peas and spinach taste has always been there, and quite interesting at the same time. The leaves appearance match that of any typical Wuyi though they do seem to be a bit larger than I typically see, though no where near as large as the One-hundred year tree. The aroma of the rinse is warm and welcome on a day that would fit right in much further into fall. Yet the aroma reminds me of birch wood, with a distinctly fall aroma, but not in the same sense as puerh. The color of this is lighter than I was expecting and unless my eyes deceive me slightly cloudy. But the aroma is of baked goods in the fall, and an old childhood favorite of mine cinnamon and sugar toast. But there is something distinctly apple like. Cinnamon and apples it is indeed, the taste is there, plentiful cinnamon, and a tart apple. The second infusion is slightly darker, and has a much rounder and fuller aroma, but same basic aromas. This tea now makes me wish I had more, as it was truly a magical experience today. Easing stress, and edging me into a state of non-caring. Not in a apathetic sense, but as in a state of relaxation and not being agitated about what I have yet to do, this weekend. Just on opening the bag, my stomach started to hurt, it knows I will need food to accomplish a full session of this tea. The dry leaves look as dark as they smell, and the smell reminds me of a wood charcoal. It has the characteristic smell that the high fire, traditional roast, classic roast teas have, yet probably the reason this one is in the every day category, it lacks depth, and smells rather acidic. But the white mist is forming over the tea in the cup, which is something I've associated with making a good cup. Though I do want to say the smell reminds me of Cherries Jubilee. This tea actually really concerns me, Its smell is the best part, and that is not even that great. The finish is ashy and acidic, while the taste is bitter like bad dark chocolate. On a good note, this tea is incredibly hard to make worse... as on the second steep I got sidetracked in thought, and found myself with an extra long steep. Though I think cooler water might have been a bit of the saving grace on that. So I have a tiny porcelain jar which I got on ebay. I like it as decoration, but I'm using it as a tea aging testing ground. I put 60-70 grams of tea into it, as much as it holds, and I will visit it in the future to see if aging might help this tea. Seeing as the amount of tea I put in there I figure it would probably be best not to touch it for 4-5 years. In short this tea did not impress, and in fact I think its a tea that even when brewed by experts will fail to impress. So What good can come out of this tea? This tea at its price will be great for getting your brewing skills in order, though as its rather lenient it will also serve as a tasting exercise trying to dial this tea in to where it tastes best and get that experience consistently. Or if you are willing to try an aging experiment, and don't want to take the chance with small quantities, you can buy a large amount of this for a lot less cash than a more premium tea. Secretly I think this tea will come alive after many years. I can not explain why other than I think the acidic and char will diminish, and the aging will round out the flavor more. In the tea world, as I think is true with many products teas are often dressed up to sound amazing, usually given labels such as premium, superior, imperial, etc. Just to sound like it is something special. So as I just wanted to refer to this as Anji Bai Cha, I do not know if Jing Tea shop will ever sell a different one under a different "grade" so I felt it was somewhat necessary to specify. Anyway onto the tea, the teas appearence at first glance is of tiny little needles, then upon closer inspection you see it is actually a leaf and a bud rolled together to make it appear to be one slightly larger bud. But its aroma is quite welcome as we decend into fall, as it is a reminder of fresh melons and blooming trees. While its taste is has the texture of melon juice, with a subtle hint of sweetness completing the felling. Also a bit of a cereal taste in there also. Its taste is amazingly clean, and finishes on a fresh spinach salad note which lingers for a bit. I should note that the second infusion was just as great, with the melon flavors replaced by a vegetal cucumber/lettuce flavor. I think I secretly judge a vendor by how much I like their Da Hong Pao, as it is a tea almost synonymous with Yancha. Even as most vendors have a Da Hong Pao, and possibly not the other Si Da Ming Cong (4 famous tea bushes of Wuyi). So I think in taking a close look at the Da Hong Pao a vendor offers, I think I can get an impression of the vendors tastes when it comes to Yancha. I don't know if its been the lack of tea I have had in the past few days, but the aroma of this is amazingly welcome and familiar, but I must say it has its own certain characteristics that set it apart from others. I get marachino cherries, with roses, but a hint of caramelized sugars, and believe it or not, I think there is the smell of roasted carrots believe it or not. I do not think I could have made this any more smooth, perhaps a slightly longer steep next time, but it has a presence on in the mouth that coats but nothing stands out screaming its presence. There is the hint of a nutty and buttery notes, but it all blends into a creamy texture. The finish though is cooling like menthol and leaves me salivating for more. The most amazing thing about this, is its color is like an ultra clear honey, or a translucent piece of amber. Quite visually pleasing. I should note as I've been starting to take into account how the weather factors into the taste of the tea, it is a mild day with a Steel sky in the home of Bethlehem Steel. This tea puzzles me, it has an amazing aroma, but I feel its lacking on the palate and finish, even with a relatively stuffed pot, a little over half full after shaking to settle the leaves. But even though there is a lack of flavor in the finish the impression and feeling it leaves is quite welcome. Yesterday a order from Jing Tea Shop arrived which contained a large amount of different tea's as I wished to try a bit of everything. I'm breaking out of a comfort zone, and while I have been told how to brew Chinese green tea's I am not fully aware of the subtleties which may produce an exceptional cup. Although Upon the arrival of the package I did quickly whip some of this up to take with me to class, as a glass brew in a thermos. I thought it passed that test quite well actually, and hope to test it under more strict structure. 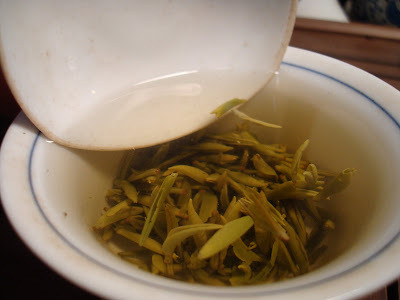 So I am drinking this out of a gaiwan, and after preheating the gaiwan and adding the leaf, I found the smell to be extraordinarily sweet, with a slight grassy aroma. Its taste is slightly bitter like spinach, but rather full and welcome. I think everyday describes this correctly, its is a means to drinking tea, and to practice making tea, but it is nothing exceptional. Though I must say it certainly is a bargain for its quality compared to what you can find in the Western Hemisphere, for around the same price including shipping. Though I'm not sure how to describe this, it almost reminds me as though I'm inhaling a fog or mist in a heavily wooded area during spring. Just an overwhelming sense of vegetation comes to mind when drinking this. By far the biggest downside to this tea, is any infusion beyond the first is seriously lacking substance. Even with leaving a root at the bottom of the gaiwan.